Subscriptions to Koryolink, North Korea’s only 3G mobile phone network, have just passed the 2.4 million mark, according to the latest figures from the operator. The figure represents a significant slowdown in growth in the last year over the previous year and points to the first big spurt in subscriptions being over. The carrier might have to start working harder to continue attracting new users. At the end of June, the network had just over 2.4 million subscribers, according to Orascom Telecom Media and Technology, the Egyptian company that owns 75 percent of the company. The last time the company announced subscriber data was in May 2013, when it said Koryolink had hit 2 million users. That puts growth at 400,000 subscriptions in just over a year. 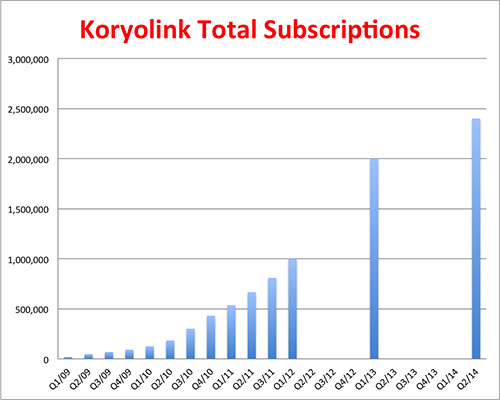 In contrast, Koryolink added a million subscribers in the 15 months prior to May 2013. Koryolink had released detailed quarterly financial and service information until the beginning of 2012 when a corporate reorganization at Orascom led to much less detailed earnings releases. The service is operated by Cheo Technology, a joint venture in which Orascom holds a 75 percent stake and North Korea’s Ministry of Posts and Telecommunications holds the rest. It launched in the final few days of December 2008 and its signal now covers most populated areas of the country and major roads and railways. Typically, users have access to domestic calling, text and picture messaging and a domestic intranet service. International calls and Internet access are banned, except for resident foreigners, tourists and selected elite members of society. 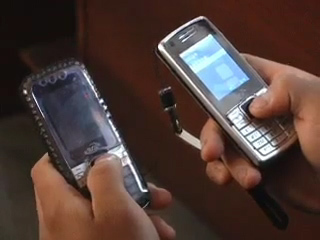 Even with the restrictions, which are similar to those on home telephone lines, cellphones have become a common sight in Pyongyang and other major cities. However, access to the service requires foreign currency — something not often available to poorer homes, especially in rural areas — and the price of the handsets and phone service is relatively expensive. A recent report by Radio Free Asia said shops are springing up in parts of China near the North Korean border that offer cheap handsets compatible with North Korea’s network. But buyers need to bride border guards to let the phones into the country and then bride officials to let them register the phone on the Koryolink network. If the service is expensive for North Koreans, it’s even more expensive for visitors. Koryolink began offering tourists Internet access via 3G in 2013 and charged 150 euro for 2GBs of data and 400 euro for 10GBs. The SIM card and international calling came at an additional charge. The service has resulted in a number of posts to Twitter, Facebook and Instagram from points across North Korea. Last year, photographer David Guttenfelder was named Time Magazine’s top Instagram photographer thanks to his series of posts from the country. At the time he was working for the Associated Press. Last week, reports emerged that said Koryolink is now deactivating SIM cards issued to tourists as they leave the country. The policy, which appears to be new, has closed a loophole that would have allowed the cards to be smuggled back into North Korea and given to local citizens. That would have provided them with unrestricted Internet access.